In Zimbabwe we say Wafa Wanaka (the deceased has no blemishes). But this is a generic phrase normally used for one whose good works are hard to put together after he has gone. With Tuku, we say matipa matitorera (you give and take). We were given and were later robbed. This was a man of many talents. Music that lasts is not easy to compose. Fellow Zimbabweans, please join us mourn the departure of one of the best musicians we ever had in Zimbabwe. Oliver Mtukudzi was one of us. We started way back in the sixties in Harare and charted the same path for the same cause as we sang, entertained and educated from different platforms and at times from same platforms. I will say that last year in 2018 when we joined hands on the stage at the Glamis Arena, little did we realize that we were doing our parting shots. Kwaive kuonekana (it was a parting short). It was a night well spent with our fans as we sang and danced to celebrate a surprise twist of events in Zimbabwe. The rest of the history would unfold as we kept in touch and made efforts to strengthen our music and give hope to the people of Zimbabwe. Today is a sad day. Tuku was a wonderful, kind hearted, selfless man who had the mind to care for others. I cry for a brother, friend, uncle, grand pa and sahwira (close friend). Oliver was a man of the people. He sang from the heart and he was candid as he expressed himself clearly. His fame rested on solid pride in his culture, his Ubuntu and his focus on what mattered most to his life. People. He found so much value in the people and spent so much time investing in various projects to make people stay focused and be together. At times he added his dance styles and sharp sense of humor to spice up his music. Many enjoyed his music which could be deemed classy and timeless. He sang for all times, generations and occasions and everyone was left with something to chew upon. That was Oliver for you. 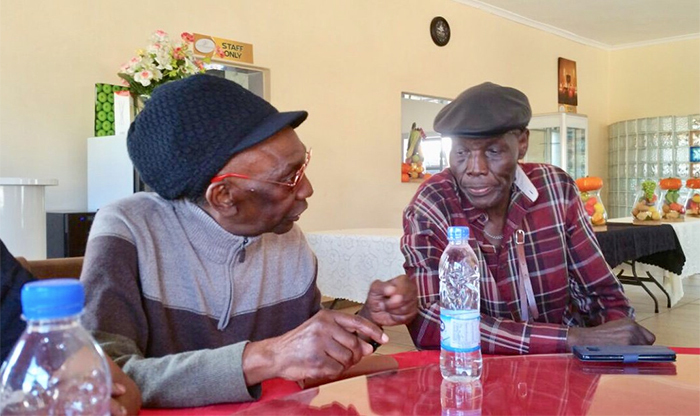 Today Samanyanga joins Sam Mtukudzi his dear son who left a few years ago. Mukorekore left a great katekwe foot print and big shoes that many budding musicians will find tough to fill. Not so many of our budding musicians will be able to cope with cultural balances and dynamics faced today. He just did that. He sang not to chase money but to create value in his convictions. Of course money followed his values and he created a steady life that many looked up to. With his Pakare Paye Arts Center, he built himself that legacy and sign post of Tuku music that will forever make his name memorable before many artists and fans.